Class 24 #3655 named Jenny was originally used in the then South West Africa (now Namibia). After being withdrawn from service there, she was used at Paarden Eiland / Belville. The year 1948 saw the introduction of the 2-8-4 or ‘Berkshire’ wheel arrangement on the SAR with the placing in service of one hundred Class 24 branch line locomotives. 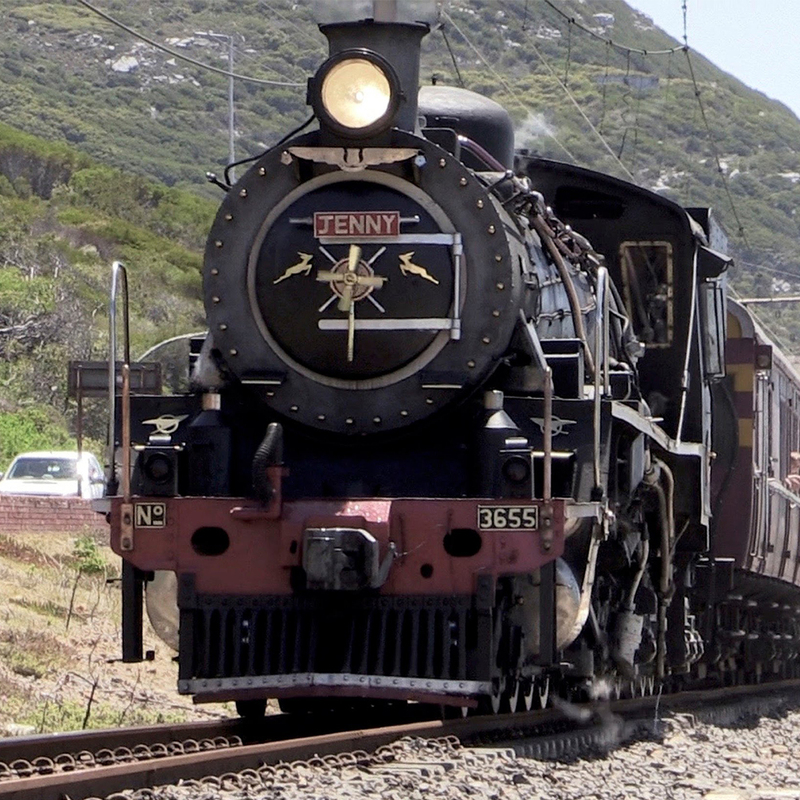 #3655 has now been leased by Atlantic Rail from Cape Western Vintage Railways and Atlantic Rail has taken over responsibility for maintaining her. Class 19B #1412 named Bailey (coal burner) was manufactured in 1930 in Germany and was virtually identical to the Class 19 locomotives with the exception of the wheelbase of the front bogie. It also has a 4-8-2 Mountain-type wheel arrangement and a Watson Standard boiler. In 1930, the South African Railways placed fourteen Class 19B steam locomotives with a 4-8-2 Mountain type wheel arrangement in service. One of them was later reboilered and reclassified to Class 19BR. 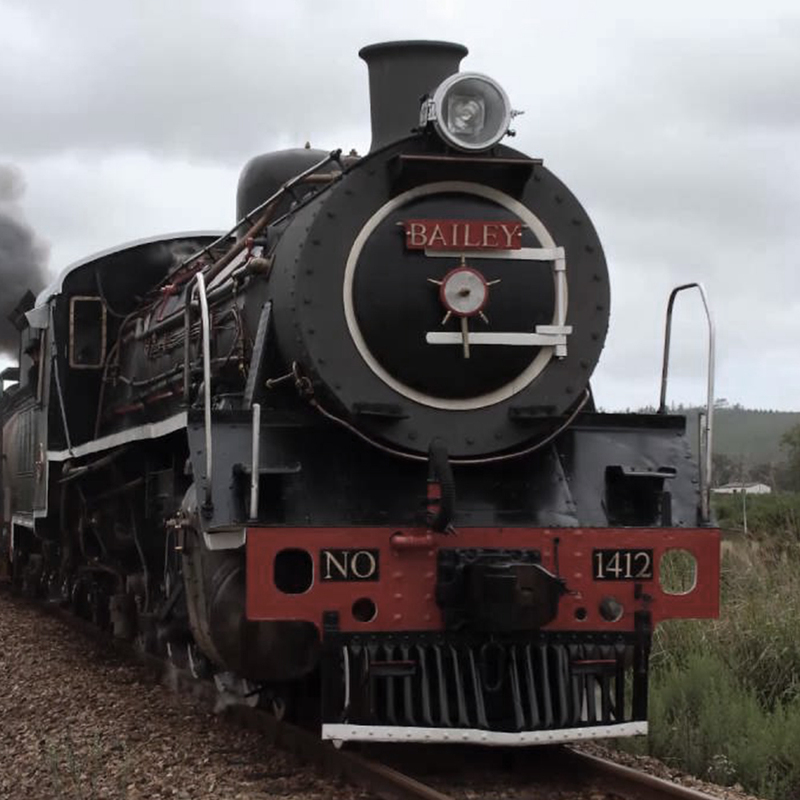 The South African Class 19B, numbered in the range from 1401 to 1414, was a later model of the original Class 19 which had been designed in 1928 under the supervision of Colonel F.R. Collins DSO, Chief Mechanical Engineer (CME) of the SAR from 1922 to 1929. Coach 1893 originally was a class D-15 First and Second Class Mainline Composite coach. These coaches were built from 1913 right through to 1930, many being produced in South Africa. Our Coach 1893 however was one of a batch of 8 that were imported in 1926. A total of 177 D-15 coaches were used by the South African Railways. The coach has a tare of 72500 pounds. The coach was only recently changed to a lounge car. Modifications included removal of most of the compartments and coupes, removal of the toilets and cupboards at the middle and the creation of the bar and store room along with benches running along the sides of the one half of the coach. Coach 1768 is one of two E-13 second Class Mainline coaches used by Atlantic Rail. Both Atlantic Rail coaches have had the Compartments and Coupe at the one end altered. In Coach 1768 this is now an open seating area with chairs. One of the original compartment benches is still in this seating area. Coach 1788 is the second of our E-13 Second Class Mainline coaches. As with 1768, this coach also has the end coupe modified. On 1788, work has been started to change the coupe into a shower. The compartment next to the shower has been altered into an open seating area with a fixed table between the benches. One of a batch of 10 built in 1936 at PRR, it has a tare of 79 850 pounds. Coach 4786 is one of a series of two class O-26 Second Class Suburban Commuter coaches imported in 1920, In total 9 were bought by the South African railways in the years 1911 to 1921. Of these nine, only one was manufactured in South Africa, the rest were all imported. It has a tare of 69 600 pounds. Escape the rush of the modern day life, let off some steam and hop on to Atlantic Rail for a day trip back into history on extraordinary steam locomotives.